First Line: My name's Kate Shackleton. Normally a peaceful Yorkshire mill town, the only exceptional thing to have happened in Bridgestead is when mill owner Joshua Braithwaite went missing and was never heard from again. Now Braithwaite's daughter Tabitha is getting married, and she wants to try one last time to find her father. She turns to Kate Shackleton, a friend since their Voluntary Aid Detachment days during World War I. Kate's husband was listed as missing in action/ presumed dead during the war, and since the Armistice, she has been having a bit of success finding missing husbands for local women. But once Kate turns her skill to the puzzle of the missing mill owner, she discovers that someone is willing to kill to keep the secret. This first book in the Kate Shackleton series takes place during the 1920s in the Bradford and Leeds area of Yorkshire. This area was the heart of the cloth trade in England, and I loved the fact that each chapter began with a textile term. I had no idea that so many words and phrases from the manufacture of cloth had made their way into everyday speech. Kate Shackleton is young and independent, thinks nothing of driving herself anywhere she wants to go, and asking questions wherever she thinks they should be asked. Being advised that she needs help with some of her investigative work, Kate hires former policeman Jim Sykes, and it's fun to watch the two of them get used to working with each other; Kate not being used to having an employee, and Jim not used to such a Modern Woman. The person suggesting that Kate get help was wise because this case developed into a very complicated one that kept me guessing at every twist and turn. 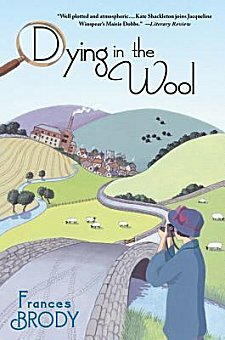 I really liked the time period, the setting, and the plot of Dying in the Wool, but the characters didn't quite come to life as I'd hoped they would. Kate, Jim and Tabitha seemed to have extra measures of British reserve that kept me at a distance the entire time I was reading. Even so, this is a good, solid mystery, and I will be visiting Kate Shackleton again to see if she's warmed up to visitors. I really enjoyed reading this one earlier this year. Sorry to hear it didn't live up to your expectations. Hoping book #2 is better for you. Cathy - It's the characters that make a story isn't it? I'm a sucker for a good historical-setting novel, so I hope these characters come a little more alive for you as the series goes on. I'm especially interested in the time period. The 1920s were such a pivotal time in a lot of ways. I have to admit that there's another reason why I want to read this series so much: some of my ancestors come from Bradford, and I've been there. I really enjoy the references to places that I recognize. Hopefully the characters will come to life further along in the series. I have a feeling my mom would like this book. Sounds good, Cathy. I just saw your cover pin on Pinterest and came by to check and see what this book was about. I'm adding it to my list. The UK covers of Brody's books remind me of the covers for Jacqueline Winspear's Maisie Dobbs books. I'll have to check this series out. Thanks Cathy!